There is no doubt that the images and video from this ordination service has blown up like wildfire across the body of Christ. No matter if you’re black or white, PAW or Baptist, young or old – these images have created a controversy within the Body of Christ. I want to look at this, not in sexual terms. In the church we have this bad habit of equating a lot of things in a sexual connotation. That’s not my desire, so if you’re looking for some salacious reading material – move on to the next blog. I want to look at this in terms of what Consecration and Ordination are about and mean. I was 24 years old when I was ordained. I preached my first sermon in April 1978 at New Hope Missionary Baptist Church, then pastored by the late Dr. A. Bernard Devers, I. I, along with my brother-in-the-ministry, Walter Monroe Brown, Jr., served as Co-Interim Pastors of New Hope for six months in late 1984. When the new pastor arrived, Dr. Johnny Pack, IV from Texarkana, Arkansas, the church wanted to reward our faithfulness and voted to ordain us into the gospel ministry. 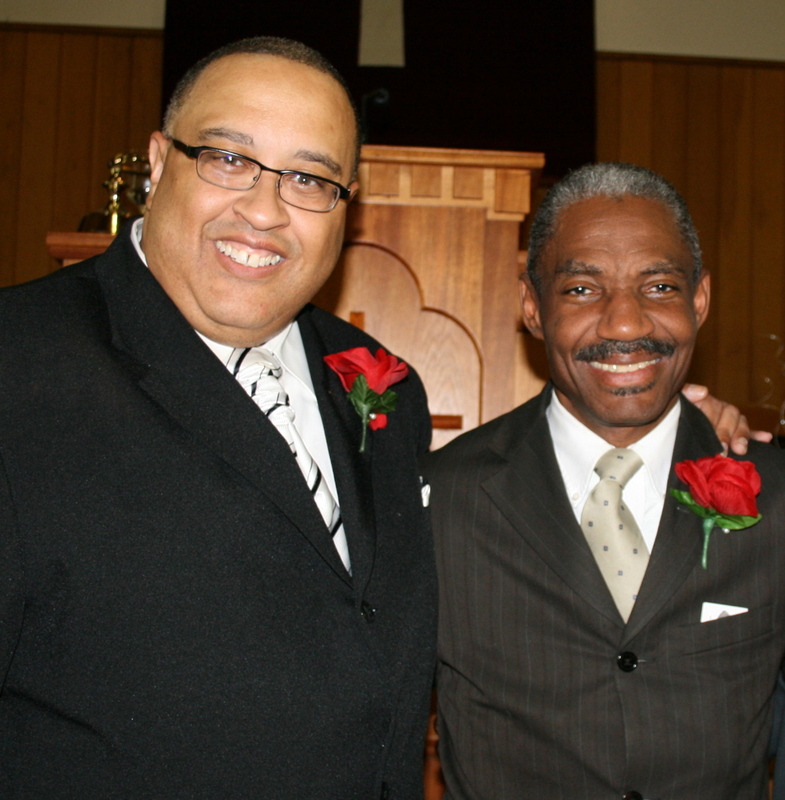 Pastor Robert Earl Houston and Pastor Walter Monroe Brown, Jr., circa 2011. I remember vividly our ordination service. The place was PACKED. Portland hadn’t seen a multiple-minister ordination. The late Rev. Eugene Boyd, Jr., who was Moderator of the Union Baptist District Association, served as Chairman of the Council. We faced the audience as we were publicly quizzed by leading pastors and ministers in the area – Dr. T.L. Lewis, the late Rev. Robert C. Hill, Dr. James Clarence Edward Faulkner, Rev. George H. Merriweather, Rev. Edward Dobbins, and Rev. Donald Frazier. After examination, the council retired, tabulated their voices, returned and Dr. Faulkner gave report of the council. We knelt before the altar, the Pastors and Ministers laid hands upon us and we were officially ordained as Baptist Ministers. Following the prayer, they greeted us, and then we were presented with our Ordination Certificates by Pastor Pack, who then took us downtown to have our paperwork registered with the City of Portland Clerk’s office. I think that many of us in the Church have a problem with this because of the lack of Biblical justification. The contact that is mentioned in 1 Timothy 5:22 says “lay hands on no man suddenly.” For the life of me, I only see the words appoint, or transference of authority – but that’s not done in the manner that we’ve seen. My problem with this is that it has become a mockery of ordination and for those who are in the bishopric, consecration. I was led to believe that one of the facets of being a bishop was to uphold the mysteries of the kingdom, but not to write the mysteries as you go along. Again, there is no Biblical justification for an ordination that we’ve seen. Further, any ordination that I’ve seen or authorization of ministry that I’ve seen is done by either anointing (of oil) or laying of hands. Ordination should not be turned into a mystical event. Ordination should never raise more questions than it answers. Ordination should never turn that which is sacred into that which is open to ridicule. Ordination should end with a celebration of what God is doing in the candidate’s life and not a scar that will follow him the rest of his ministry. Pastor Jackson has a right to conduct services however he sees fit. That’s the Baptist in me talking, because I believe whole heartedly in autonomy of churches and pastors. I would never tell him or any other pastor, without their permission, what I think should happen in their churches. That’s a line that should never be crossed. However, by the same token, it should be understood that however you conduct a sacred service, you cannot silence questions by throwing a blanket answer as if to say “this is spiritual y’all and it’s deep – if you can’t see it, that’s because you’re not spiritual” (my words, not his). The last time I read an explanation like that, it was by a naked king who was sold an invisible garment. I know we operate in the spiritual realm – but operating in the spirit should never negate or overrule the words of Scripture. Unfortunately, the Church is like a bad drug addict, looking for that next “ecclesiastical high” whether it’s titles, practice or attire. Instead of going higher in the Lord, we are headed to the abyss. I have 13 associate ministers. I reckon at some point, if the Lord allows, I will be recommending some of them to be ordained. But ordination is not done lightly. The testament of that at FBC is that I have yet to perform an ordination service. Licensing of ministers used to be on-the-spot, but after reflecting over the process, it’s now done after one year of faithful service. Again, it should be with the goal that ministry is a long-distance race and not a fast-sprint. Walter and I just celebrated 28 years of ordination this past February. Walter has pastored and served churches in Portland and preached throughout Oregon, Washington, Idaho and his native state of New Jersey. God has seen fit to allow me to serve five churches in pastoral ministry, preach across the country. For us, ordination was not supposed to cripple our ministry – it was supposed to endorse it. Ordination was our springboard and not our tombstone. What the world has now witnessed could never be interpreted as an endorsement, but rather as a crippling event.